One super simple way you can help CCA raise funds to send kids to surgery and host the Annual Family Retreat & Educational Symposium is by starting a FirstGiving page for CCA. FirstGiving is a great way to involve new people in helping CCA and it comes at a great time, as part of our Matching Challenge Grant. For every dollar we raise from new donors, it will be matched 100% up to $25,000! 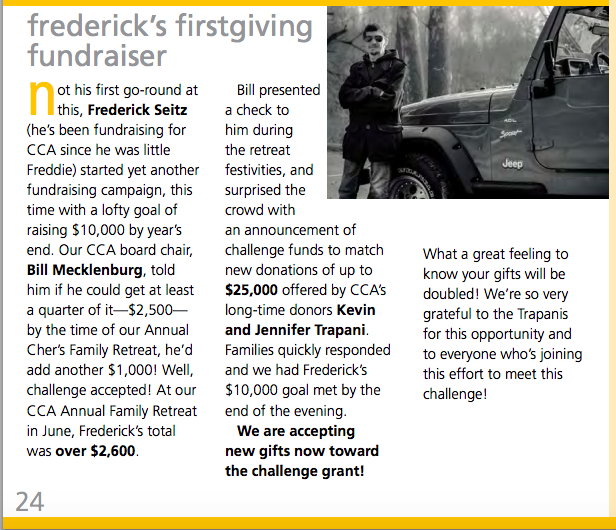 So if you start a FirstGiving page and 25 friends donate $5 each, you've raised $125 which turns into $250 for CCA because of the Matching Grant. This is a fun, easy way to involve your classroom or group in #CraniofacialAcceptanceMonth. Let us know if you want to pitch in and we'll help tell your story like Fred's success below (also on page 24 of the Current Newsletter). we appreciate your generosity and kindness. Links of Love is Friday! Thank you! #NTXGivingDay was Success! Today is #NTXGivingDay! Get Sharing! #CAM2015 is Making National News!